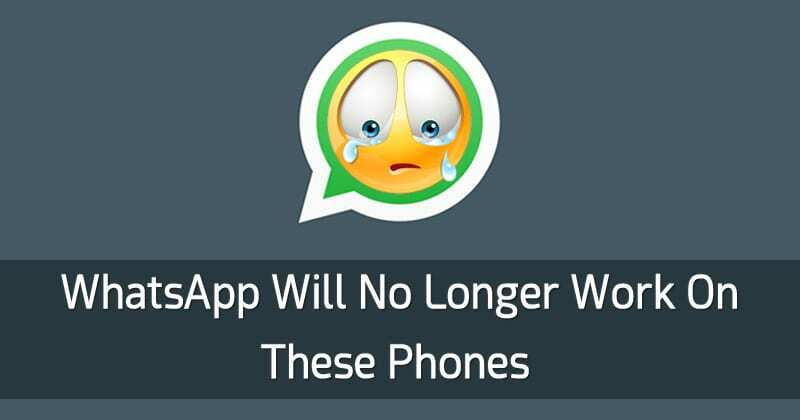 WhatsApp Will No Longer Work On These Phones! Technology Internet WhatsApp Will No Longer Work On These Phones! WhatsApp has again planned to end support for devices that are no longer important according to them. Recently, the company announced in one of its blog post that it will end support for Blackberry, Microsoft Windows, and Nokia. It might be bad news for few WhatsApp users! As we have already seen, WhatsApp at the end of every year ends support for few number of devices. The previous year we have seen WhatsApp ending support for some outdated devices that are no longer used. Now, it looks like the company is ending support for more devices. WhatsApp has again planned to end support for devices that are no longer important according to them. WhatsApp is now owned by Facebook and the instant messaging app is used by a majority of users worldwide. Recently, the company announced in one of its blog post that it will end support for Blackberry, Microsoft Windows, and Nokia. So, if you are running Blackberry OS, Blackberry 10 and Windows Phone 8.0 or Older then you will no more use the app after December 31, 2017. To recall, the company had already extended the support for both platforms in June this year. The company had also announced a list of platforms that it ceased support for in February. These included Android 2.1 and 2.1, Windows Phone 7 and also few version of iOS. For the complete list of devices that are going to receive the end time. Visit the official WhatsApp Blog. So, what do you think about this? Share your views in the comment section below.